The arrival of April means preparing the raised beds for the new growing season. A couple of hours last weekend pulling out spent cabbage plants, straggly spinach and a whole lot of weeds turned a messy view into a reasonably tidy one. 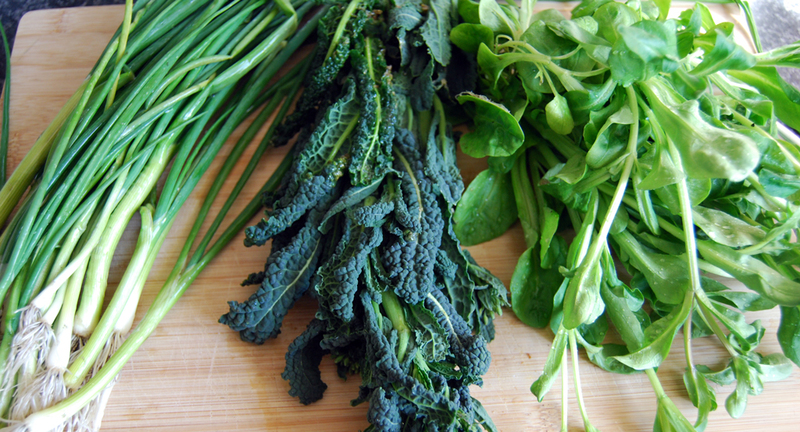 Spring onions, kale and Lamb’s Lettuce: a final crop. As a bonus, a small final crop found its way into the kitchen. The spring onions were actually Paris Silverskin pickling onions which never quite bulbed up for some reason, but as scallions they were very nice finely chopped and sprinkled over several dishes. Red Cherry, which were free too. All germinated very quickly in the heated prop and, on a not very bright windowsill were leggy and spindly within a week. So I’ve turned the heater off to slow them down and moved them to a brighter spot where they shouldn’t reach for the sky so much and should thicken up. They’d better had: some of the seeds may have been free but the Tomatoberry were £3.69 for an average of seven seeds (I got six). Even for F1 seeds that’s pretty steep. £3.69 for an average of seven seeds! Alongside the toms I’ve sown more lemongrass. I love Thai food and would like to grow my own stock of this key ingredient. I did so last year but they didn’t survive overwintering in one of the blowaways. I’ll grow them in a container again and come the winter will bring it indoors. You need more than a year to get the stalks big enough for use in cooking so there’s some persistence required. Outside, preparing for planting potatoes meant chopping up the green manure which had been growing well since October last year. I wish I’d noted the variety of green manure, but only so I can avoid buying it again. It turned out to be one of the most strongly-rooted plants I’ve ever encountered. Where in the past I’ve sown mustard and, come the time, quickly shredded the foliage and turned it over into the ground, this stuff was like digging through carpet. Special hard-wearing commercial grade carpet. The soil sat there laughing at my spade. The roots of this variety of green manure were deep, entwined and matted together. 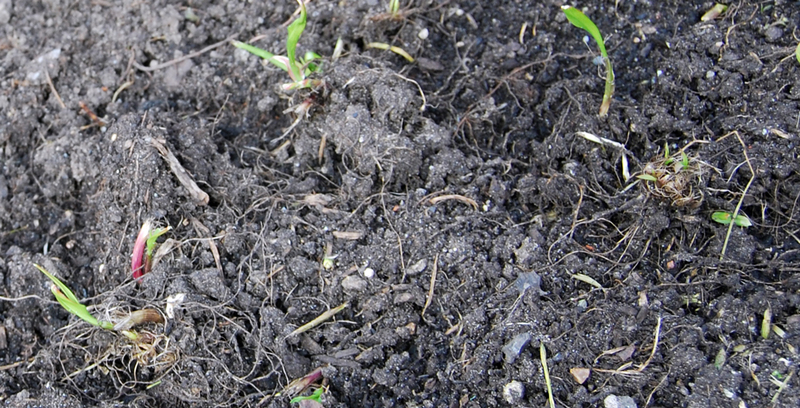 I know they’ll have laced the soil with the lovely nitrogen that growing vegetables crave but what was once nice loamy, sandy soil had turned into a tangled mess. I dug, pulled out and sifted what I thought was everything. A week later, the darned stuff was growing again: fresh green shoots had popped up. So another dig today got out what I think was the last of it. Next season it’s back to good old caliente mustard and nitrogen-balanced fertiliser. 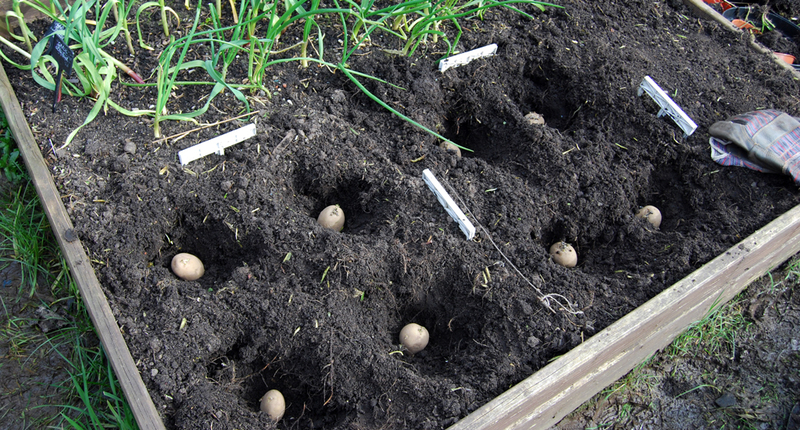 After all that the spuds are now in, just four each of Rocket earlies (I’ve just got to serve some of those with rocket salad: ‘Would you like rocket with your rockets?’) and Maris Piper maincrops. I checked the soil was just about warm enough and they’re now fleeced over to build up some heat. 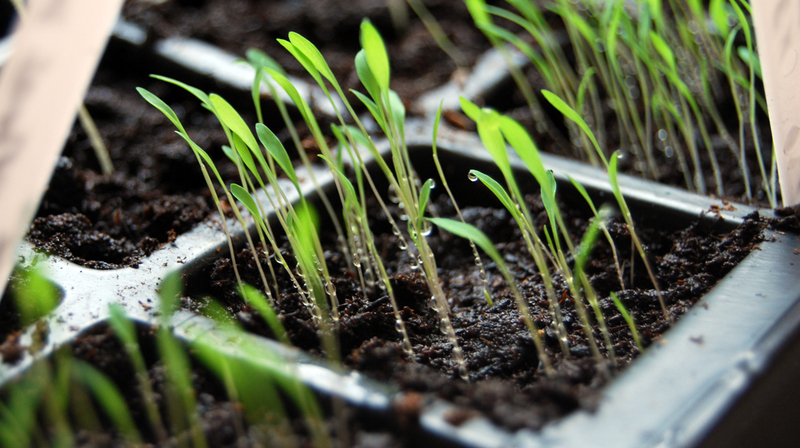 They’ll be growing alongside over-wintered garlic and Japanese onions. Back indoors, the chilli plants are looking well now that they’ve graduated to individual pots. 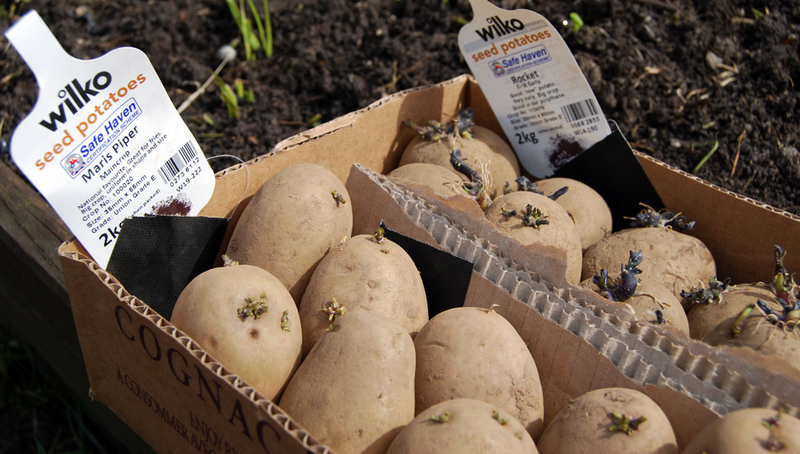 Some of the varieties are specialist extra-hot strains, which benefit from warm conditions for the whole of the growing year, so I’ve put clear dome lids on them for now until summer warms things up. The lids are also to protect them from fungus gnats, which round these parts seem to find their way indoors and into any bare soil. Fungus gnats are Satan’s nastier cousin, capable of killing any plant by their larvae eating its roots. 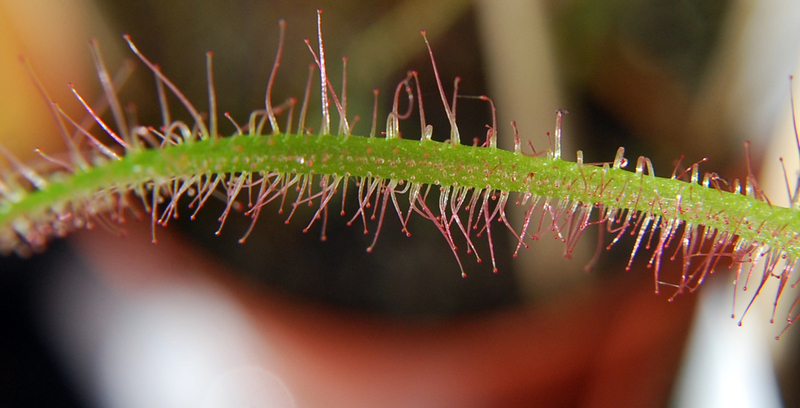 So to further satisfy my phobia about them the house plants are now accompanied by a row of Fork-leaved Sundew. These strange spindly specimens specialise in killing flies, specifically tiny ones like the dreaded f.g. Zoom in on the fronds and there are lots of tiny sticky hairs. I probably don’t want to know the detail of what happens next but let’s just say ‘Hey flies .. Come and ‘ave a go if you think you’re hard enough’ ..
Hungarian Rye? Have just had the same experience with mine. It just refuses to die! Your beds look v tidy though. 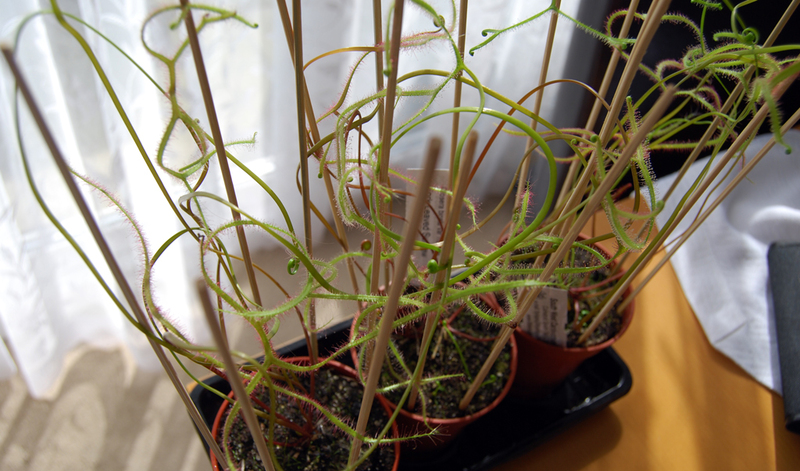 Love the fungus gnat analogy too – roll on full spring and getting stuff outdoors. Ah now that rings a bell. Yes, it was some kind of rye, thank you:-) Yes, it’ll be good to reclaim the window sills and get everything out in the sun.